Nail art is one of those that relies on patience. 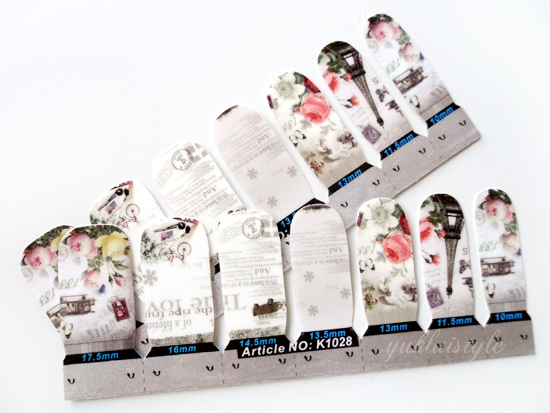 There is a shortcut which are these ready made full nail stickers. These particular ones from the Born Pretty Store, have a unique design as compared to the patterned ones you see in store. With the Paris theme, you have the generic images relating to Paris making it quite exquisite. These designs are cute but can look a bit tacky. I’ve never used any full nail stickers previously but these aren’t hard to apply. Very easy actually. 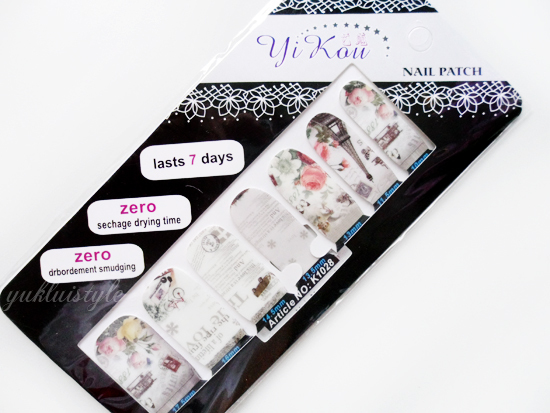 Each set consists of 14 nail stickers with 7 different sizes. You can tear them apart individually to make the application easier. Peeling the transparent film at the front then carefully peeling the nail sticker from the paper back will reveal a sticky back to adhere to your nail. Applying them onto my nail couldn’t be any easier. The sticker quality is quite good. Has a slight plastic, vinyl feel believing it will last a decent time. After the first day, I cannot see any wear and tear but on day 2, it’s starting to peel from the top of one nail. Some lasted up to 4 days with heavy use and had survived well after having contact with water. For $1.99, these are pretty decent and gave me a good first impression. 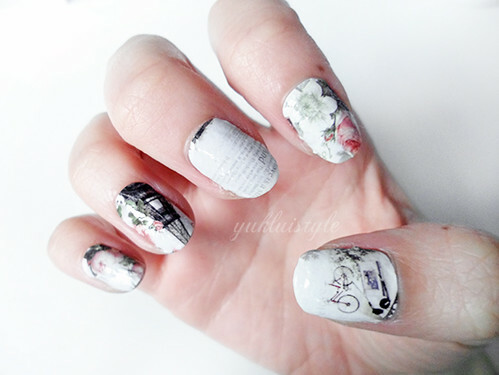 Have you tried any full nail stickers before? Next Post Eat a Lot. Sleep a Lot. I like this post! And I love your blog! Followed you on Bloglovin. I hope you check my blog too and follow-back. These are so cute! I always find nail wraps difficult to fit by the cuticles so I prefer ones that I can fill in with nail varnish, would be hard to do with these but they are adorable. How beautiful are these?! I was so drawn to these when I saw the Eiffel Tower. I haven't seen any nail foils as pretty as these before.